Recent is probably more accurate than new, but these have not been shown before. 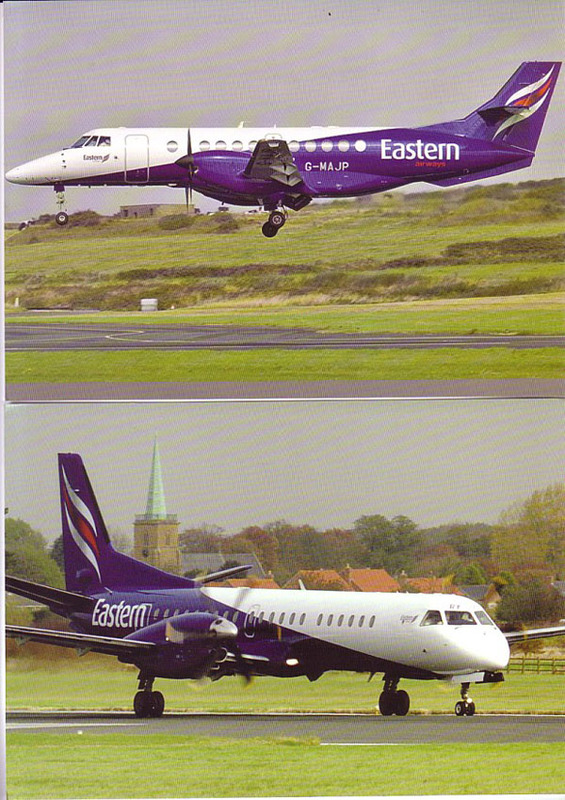 Sometime since adopting their new colours Eastern Airways have issued some large cards of Jetstream 41 and SAAB 2000. The backgrounds with a church and a field with cows and WW2 defences look distinctive but are unidentified. 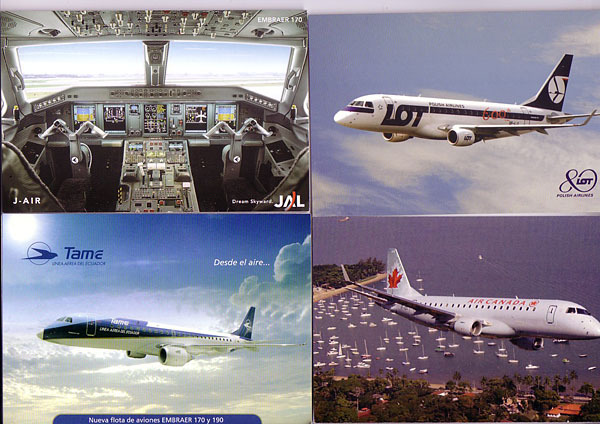 JAL has done cockpit cards of regional jets, CRJ-200 and Embraer 170. Another Embraer, a 190 comes attached to come Galapagos view cards in a joined set from TAME-Ecuador and another 175 is part of an Air Canada set which is dated 2006. Another Air Canada card features the Boeing 787. 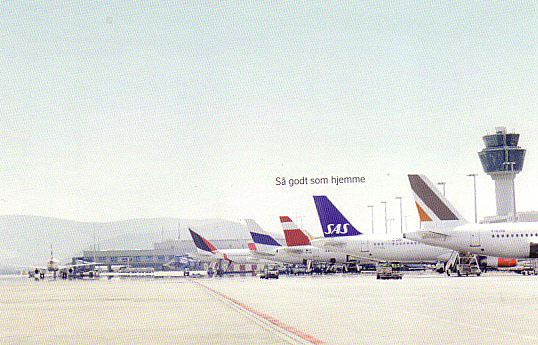 The LOT example makes up a foursome of Embraers. 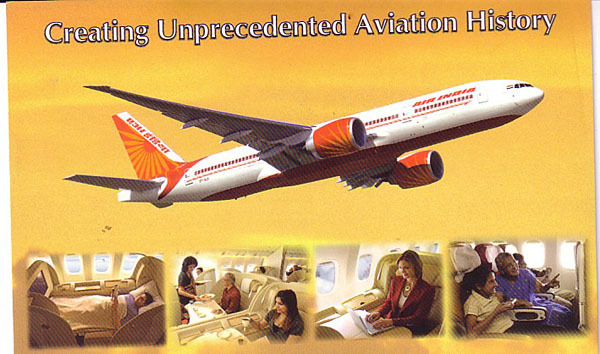 The scarcity of new airline issues has encouraged the appearance of cards which give the appearance of being airline issue but are not. 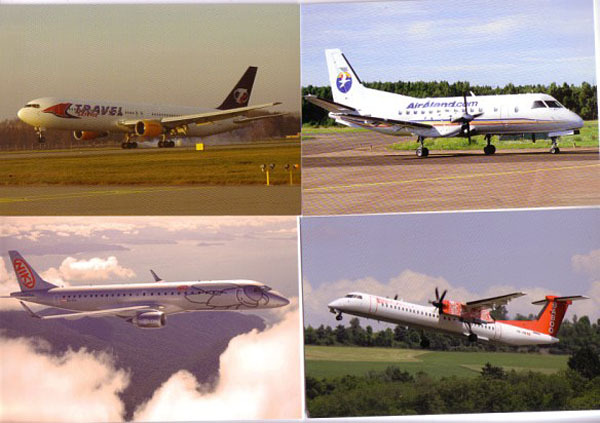 One such, which carries the airline logo but suspiciously these days, not the web-address is a set of the current Czech Airlines fleet ATR-42, ATR-72, A310, A319, A320, 737-400, 737-500, & SF340. 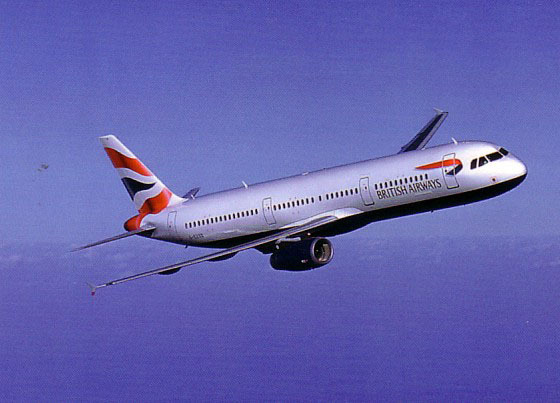 This one of BA A321 G-EUXD has an identical back to a past BA set – the one with some rather crude CGI images of 737, 747, 757, 767 plus A319 G-EUPB – all in the current colour scheme. However since then, there has been a set, believed to be for a Training Centre, with the website address on the back + some tech details. Now EUXD was not delivered until 2004, so post dates both sets. The CGI set is now probably rarer than the latter, so less likely to be used as the basis for a fake, which would have been more credible with a faked back based on the web-addressed it. However, like some of the CGI set, this one has a titling error A320 not A321 so perhaps it is bad enough to be genuine. Polarisation between feeding frenzies over the really rare and the collapse of demand for stuff once thought rare continues. The Delcampe site, which unlike Ebay can leave stuff on-line for many weeks unsold, diplays many examples of the latter. One of the more frenzied events of the past period featured a rare card of a long vanished British airport, which falls in the scope of the concluding part of Lost Airports which appears later.